The presidential candidate of the Peoples Democratic Party (PDP), Atiku Abubakar, has returned to Nigeria from the United States of America. 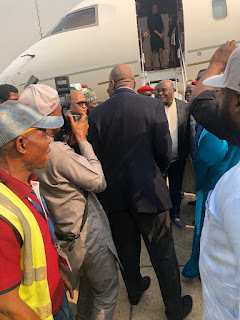 Abubakar, a former Vice President, was welcomed by a eminent personalities in Nigeria and PDP party members at the Nnamdi Azikiwe International Airport in Abuja, Nigeria’s capital. Report gathered that Abubakar visited the US for the first time in 13 years on Thursday. The ruling party has repeatedly said he was running away from investigations by the United States authorities. During the visit, the PDP Presidential candidate discussed with key businessmen, Nigerians living in US and politicians in the country. Abubakar came back in order to participate in the Presidential Debate scheduled later today at the Transcorp Hilton Hotel, Abuja.